As the name suggests, this place is specifically for non-vegetarians and meat lovers who get to choose from a large variety of meat here. 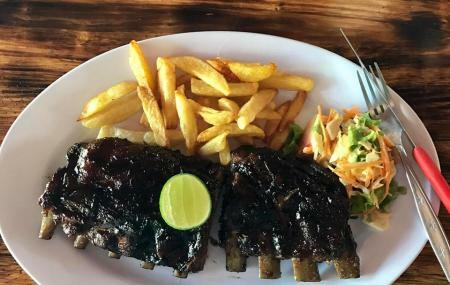 Located in the Ubud area of Bali, Warung D’atas Grill & Bbq is quite popular among visitors, thanks to its budget friendly menu and cosy nice ambience which help you to relax and spend some quiet moments after a long hectic day. The wide and vivid range of cuisine only adds to it. A great place to stop by and enjoy food in Bali. What's travelling like if you don't want to explore it like a local! Book local Bali tours and experiences. Create a customized plan for your visit using the Bali trip planner. You can use ready templates or start from scratch for the same. You can add cozy hotels in Bali like The Peacock Inn, Alas Petulu Cottages and Batu Empug Ubud. How popular is Warung D'atas Grill & Bbq? People normally also visit Jimbaran Bay while planning their trip to Warung D'atas Grill & Bbq. The pork ribs is superb! It was perfectly marinated & juicy. It was served along with sides of salads & home cut fries (unexpectedly delicious too!). I love their hot served Bali coffee as well. Value for money. Chilled place. Great place, recommended by our hostel. We had breakfast two times and lunch, it was clean,delicious, price was honest and we got to play with all the beautiful birds and parrots (bubu!). Nicest people also. thank you very much.